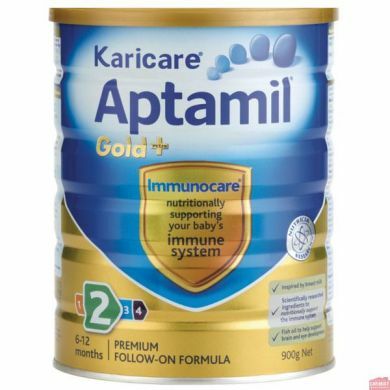 From 6 months, this premium formula is designed for the increasing nutritional requirements of growing infants. It has a unique formulation of special ingredients, including Nutricia Prebiotics. These nutritionally support your child’s digestive and immune systems. It includes ingredients important for healthy eye, brain and nerve development. Milk solids (Skim milk, Demineralised whey, Whey Lactose, Whey protein concentrate), Vegetable oils (contains Soy oil), Galacto-oligosaccharides (from milk, GOS), Glucose syrup solids, Fructo-oligosaccharides (Long chain, FOS), Dried Omega 3 & Omega 6 LCO oils [Arachidonic acid oil, Fish oil (Tuna), Antioxidants (Sodium ascorbate, Ascorbyl palmitate, mixed natural tocopherols)], Soy lecithin, Acidity regulator (Citric acid &/or Calcium hydroxide), Taurine, Choline. Vitamins (A, B1, B3, B6, B12, C, D, E, K1), Pantothenic acid, Beta-Carotene, Folic acid, Biotin. Potassium, Calcium, Sodium, Iron, Magnesium, Zinc, Copper, Iodine, Manganese, Selenium. Cytidine - 5’- monophosphate, Uridine - 5’- monophosphate, Adenosine - 5’- monophosphate, Inosine - 5’- monophosphate, Guanosine - 5’- monophosphate.